Established companies and emerging start-ups are putting a stake in the Internet of Things ground, an opportunity with estimates of 50 billion devices connected by 2020. Standing in the way for many companies is the increasing complexity of technology inside connected devices. Shortened design cycles further fuel pressure felt by designers — the shelf-life of an IoT device is similar to a smart phone, from 12 to 18 months. If your new or updated product isn’t first out the door, another product will take its place. Getting an idea hatched into a working prototype isn’t always easy, regardless of design experience. Where do you start, especially if you’re a start-up with limited resources? Today, the most important factor in deciding what processor you base a design on isn’t the chip itself. It’s about the ecosystem that supports it. With the announcement of the i.MX 7 series, we’re announcing an ecosystem of partners to help you bring your designs to market without delay. NXP offers the general-purpose i.MX 7 SABRE development board and the WaRP7 wearable reference design board accelerates wearable product development. However, the majority of our development ecosystem is delivered through our partners. 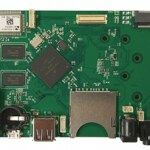 We’ve worked with six companies to deliver evaluation boards (which will be on display at our Embedded World booth) aimed at the different target markets of the i.MX 7 series. Phytec accelerates a range of embedded applications (IoT gateways, factory/ building automation, machine vision) with the phyCORE®-i.MX7 System on Module (SOM) as a drop-in CPU solution, as well as the phyBOARD-i.MX7 Zeta Single Board Computer (SBC). The Zeta SBC is a two-PCB counterpart to the phyCORE-i.MX7 SOM and provides a development kit that breaks out major interface signal to plug-and-play or pin-level connectors. Both boards support Linux. Toradex’s Colibri iMX7D 512MB and Colibri iMX7S 256MB use the i.MX 7Dual and i.MX 7Solo respectively. 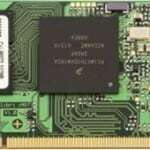 These highly efficient yet powerful modules offer advanced security features in a small SODIMM form factor. They’re well integrated into an extensive ecosystem, allowing customers to start immediate application development. Both Linux and Windows Embedded Compact are supported. The Nitrogen7 board from Boundary Devices provides a standalone evaluation platform or a production-ready single-board computer. It runs Linux, has a direct interface to a resistive touch display, and has integrated Qt 5.5. This allows for quick development of a user interface and makes it ideal for HMI. 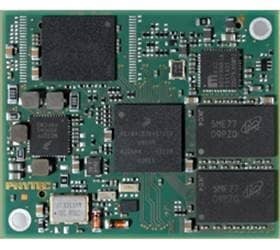 The PICO-IMX7-EMMC from Technexion is a small footprint SOM equipped with a wide array of high-speed connectivity engineered to support IoT endpoints, wearable applications, appliances, drones or industrial mobile terminals. The NOVPEK™i.MX7 from Novtech Inc. targets platform engineering by providing access to all i.MX 7 features. This enables system architects to create an intended system in a matter of days, hardware engineers to verify each combination of IOMUX, and software engineers to start developing code early in the cycle. 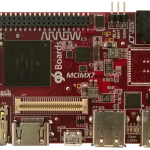 The Arrow i.MX 7Dual 96Boards Consumer Edition is the first ARM Cortex-A7 board in the 96Boards Consumer Edition form factor. The i.MX 7 HMP architecture is an ideal fit with the low and high-speed expansion connectors of the 96Boards CE design. These features (combined with the growing eco-system of 96Boards mezzanine cards) enablerapid prototyping of smart home, building automation, and portable instrumentation. Once you’ve selected an i.MX 7 board, what development and debug tool are you going to use? NXP worked with ARM to enable simultaneous multicore Cortex-A and Cortex-M system debug and trace with ARM DS-5 development and debug tool. This allows developers to fully utilize the HMP architecture without slowing down development. Utilizing both the Cortex A and M cores might require software expertise, NXP engaged early with several partners to provide support tools and services. Adeneo Embedded developed a demo that focuses on the i.MX 7’s power management capabilities (on-view at NXP’s Embedded World booth). Cycling through the different system power states of the shared Linux/FreeRTOS environment, Adeneo shows the full potential of the heterogeneous Cortex-A and Cortex-M core environment. They’re an official NXP partner for Linux, Android, QNX, and Windows Embedded development on i.MX architectures. If you’re familiar with Linux development on an Cortex-A core, the Cortex-M core offers potential for new low-power modes. It may, however, prove a challenge for those that require more than our Free RTOS. To help you fully explore the potential of both cores, NXP worked with Micrium and Prove & Run for specific usage models. Micrium’s µC/OS RTOS delivers kernel and connectivity solutions running on both cores. The µC/OS kernels, TCP/IP, CAN, USB, and File System stacks have all been ported to the i.MX 7. OpenAMP support is also available. Micrium offers industry-leading performance with increased power efficiency while lowering BOM costs due to reduced memory resource usage. Prove & Run’s ProvenCore is an ultra-secure OS kernel down to the generated code. ProvenCore can be used to build a security perimeter around your preferred OS—providing an unmatched level of defense against hackers. Once you decide on operating systems, you might want work on how to show the data collected through an effective graphical user interface. Some of our aforementioned partners (Boundary Devices, Adeneo) offer integrated solutions with Qt, a cross-platform application framework. If the need is to design a rich, high-performance GUI on a short timeline, then Crank Software’s Storyboard Suite is an excellent choice (we’ll be showing an i.MX 7 smart home solution developed by Crank at our Embedded World booth). Maybe you’re still not sure where to start. The answer then might be expert advice through technical training. HandsOn Training is both an ARM Authorized Training Center and an NXP Training Proven Partner. We’ve worked with them to develop the – Designing with the i.MX 7 Family training program. And like the rest of our i.MX 7 ecosystem, it’s available now. Want to see all of this is action, with a variety of demos aimed at the different i.MX 7 usage models? Then visit the NXP booth (4A-220) at Embedded World in Nuremberg, Germany February 23-25, 2016. Any available kits for developers !! I am interested to work and explore the device.